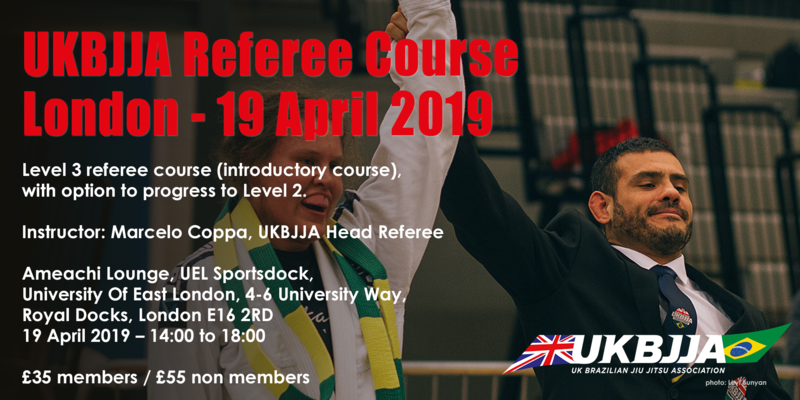 This course is perfect for anyone wishing to referee at BJJ tournaments, competitors or anyone simply wishing to improve their knowledge of IBJJF rules. Those attending will have the option to take a theory exam to attain a Level 3 refereeing qualification. Successful participants will be able to progress to Level 2 (practical assessment)* at the English Open on 20 April. The course will involve a mixture of theory and practical work. You are not going to be sat down all day listening to a lecture, please be prepared to take an active role on the course. Bring a gi, pens/pencils and notepads/paper. Please make sure you download and study the IBJJF rulebook before the course! All grades are very welcome, but only blue belts and above will be able to sit the exam and progress to the qualification. Instructor: Marcelo Coppa, UKBJJA Head Referee, 3rd degree black belt, IBJJF referee, Head referee of CBJJE. Members £35 / Non Members £55 – LIMITED PLACES, BOOK NOW! UKBJJA member discount is more than the price of membership! Sign up today!